Since last spring RSS has taken on the issue of diverting waste from landfill and recycling. A big focus of this is our composting project. To date, we have composted over 1,000 pounds of food waste! * Wholesome food that could have helped feed families in need is sent to landfills. * The land, water, labor, energy and other inputs used in producing, processing, transporting, preparing, storing, and disposing of discarded food generate impacts on the environment that may endanger the long-run health of the planet. 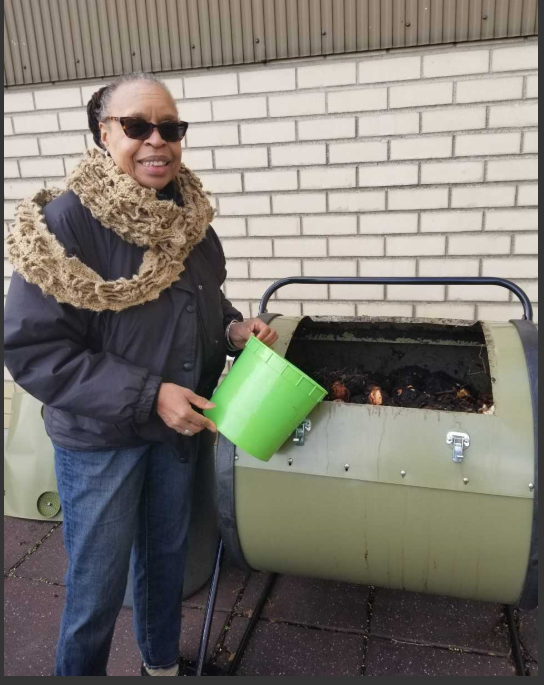 Purchased A Tumbling Composter: In February of 2018 the first tumbling composter was purchased for the terrace at RSS as a means to divert food waste coming from the kitchen. We started collecting all the raw vegetable and fruit scraps as well as coffee grounds mixed with dry material, mainly shredded paper from the office and it was a rousing success! In fact, we filled up the composter so quickly that within a short period of time the realization came that one composter wasn’t going to be enough so a second bin was purchased. Track How Much We're Composting: With the help of RSS member Roberta Todd, a system was created to keep track of how many pounds of food waste was being composted right here on the premises. And the magical number to date….1053 lbs.!!! What We Do With the Compost: That compost then is going directly back into the garden supplying the organic vegetables and native flowers growing there with much-needed nutrients that costs RSS nothing, does our part to keep garbage out of the landfills and captures carbon emissions that would otherwise go into the atmosphere. Yes, it may seem odd to many to brag about collecting garbage but, there you are!